What does modern DNA research now prove about the theory that simple cells evolved into all life on earth? The answer is simply that evolution is impossible. So why is this information being kept from the general public? Should Darwin's theories still be taught as "facts" in our educational institutions? 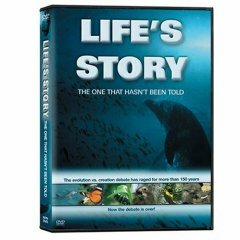 In a wildlife program unlike any other seen before, you will journey to discover the story of life itself. This program examines the long held beliefs that have been the foundation of the whole understanding of natural selection for more than 150 years. How much can animals change? Why do so many species depend upon one another to survive? Where does instinct and intelligence come from? And what do the designs of creatures alive today reveal about their history? Learn about the abilities of parrot fish and dolphins, the habits of ostriches and wildebeest, and the skills and instincts of cheetahs, giraffes and lions. Filmed and researched over a five year period in more than ten different countries, Life's Story explores all these issues and many more in one of the most visually stunning and informative wildlife productions available today. This page was last modified on 6 September 2015, at 19:49.